On Monday 11 February, the Labour Court issued a recommendation aimed at settling the nurses and midwives dispute, which had seen thousands of patients disrupted by three individual 24-hour strikes. The Irish Nurses and Midwives Organisation said there was enough in the recommendation to warrant suspending three days of back-to-back strike action which were due to start the following day. The public breathed a sigh of relief - as did the Government - although the surge of cancellations triggered by the industrial action has added to already excessive waiting lists for operations and outpatient appointments. So why are management and unions back in the Labour Court this Tuesday - with hostilities apparently far from over? The nurses' and midwives' dispute centred on pay and staff shortages in the health service. Nursing unions have long argued that mounting difficulty in hiring and retaining nurses and midwives could only be resolved by an across-the-board pay hike of around 12%. Central to the nurses' grievance was the fact that that other graduate healthcare staff like physiotherapists and speech and language therapists are paid around €7,000 a year more - while working fewer hours. However, public service unions including the INMO had signed up to the Public Service Stability Agreement - the current public service pay deal which runs from 2018 to the end of 2020. That deal delivers pay restoration to most public servants totalling around 7% - along with reductions in pension contributions. However, the PSSA rules out cost-increasing claims, and threatens penalties for taking industrial action - including a freeze on increments, deferral of pay rises and higher pension contributions. The nursing unions argued that under Clause 3 of the PSSA, special claims could be entertained in order to address recruitment and retention challenges - a view disputed by some. Last year's Public Service Pay Commission review found no generalised recruitment and retention problem, but recommended a €20 million package of increased allowances targeted at areas with the worst staff shortages. Some nurses would have received no benefit from the PSPC proposals. This got short shrift from unions - and the INMO and the Psychiatric Nurses Association went on to vote overwhelmingly for strike action. SIPTU did not ballot, preferring to pursue enhancements through PSSA processes. Fortunately, there were no adverse incidents or fatalities reported during the three individual 24-hour stoppages by the INMO. However, there was widespread fear that three days of back-to-back strike action on 12, 13, and 14 February could be dangerous - so the pressure was on management, unions and the Labour Court to get that strike called off. The result - an eleventh hour Labour Court recommendation containing enough to persuade unions to suspend the industrial action. The Labour Court proposed a new higher paid Enhanced Nurse Practice grade which nurses could access within four years, as well as a significant extension in the entitlement to some valuable allowances. But there was a sting in the tail. The financial benefits of the deal for nurses and midwives (costed at up to €50 million for 2019 and 2020 alone by the Department of Public Expenditure and Reform) were to be part-funded by cost-offsetting productivity measures in a new contract. The Labour Court urged the parties to conclude contract negotiations in three weeks - but by last week, even with the assistance of the WRC, it was clear that the parties were back to deadlock. The Government's final proposals were dismissed by unions as excessive, onerous, unacceptable, and in breach of the Labour Court recommendation. So what was the Government seeking? First, management demanded variations and flexibility in shift duration - ranging from 4-12 hours - to enhance service delivery. It also sought the ability to redeploy staff to locations up to 40km away - possibly during the same day. The new contract would also have restricted the right to double-job - for example by working as an agency nurse on days off - in case they breached legal working time limits. 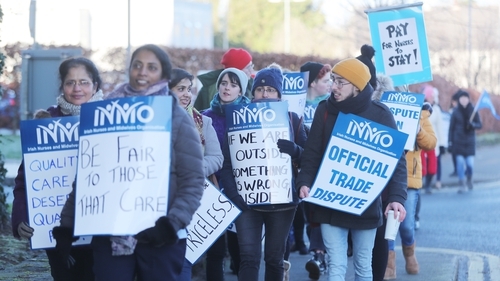 INMO General Secretary Phil Ní Sheaghdha blasted the proposals, arguing they would make nursing insecure, potentially worsen the crisis in recruitment and retention, and would be completely unacceptable to her 40,000 members. SIPTU, which represents 4,000 nurses - but did not take industrial action - also rejected the management proposals out of hand. Earlier this week, it was decided to refer the contract negotiations back to the Labour Court for clarification - and that hearing will take place tomorrow morning. The stakes are high on all sides. Unions have to sell the deal to over 40,000 members, who will want significant reassurance that the productivity demands of the new contract will not effectively wipe out the pay gains of the Labour Court recommendation, or make their working environment less secure in terms of location and working hours. The HSE is aware that changes in work practices must slot in with the future challenge of implementing Sláintecare - which will require reforms across all grades and sectors of the health service. The Department of Health knows that any increase in its pay bill - unless self-financing - could impact directly or indirectly on service delivery. But perhaps the biggest challenge is for the Department of Public Expenditure and Reform, which oversees public sector pay for over 300,000 state employees. It knows that the nurses' deal is already stretching the PSSA to the limit - and possibly beyond. Other public service unions - including the largest, Fórsa - have already warned of knock-on claims coming down the track. A similar deal for gardaí in 2016 triggered knock-on claims costing €120 million. Only significant verifiable productivity offsets will stave off allegations of the Government caving to unions, and loosening the purse strings on public sector pay - while making it clear to other public service groups that there is no such thing as a free lunch. The Government also faces the tricky decision of whether to impose penalties on the nurses for taking industrial action in breach of the PSSA. If it doesn’t, the Association of Secondary Teachers in Ireland will be furious - as their 17,000 members are still suffering financial losses after being penalised for striking some years ago over pay inequality for new entrants. So far the nurses have said that they are pursuing their grievances through existing procedures. However, this dispute is not over - and further strike action cannot be ruled out.